Forever Manchester was delighted to receive a cheque from Denise Walker, Area Sales Manager for Geberit UK, as a donation following Geberit’s nationwide initiative to promote their shower toilet technology. 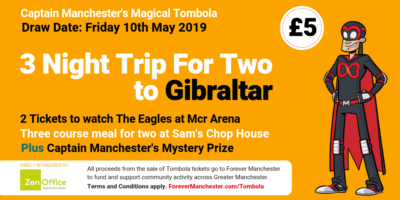 Encouraging members of the public to try out a toilet may be a novel way of raising money for charity, but it proved an effective one too, with £1,000 being raised for Forever Manchester by bathroom manufacturer Geberit. The people of Manchester came out in their droves to take a look at the Geberit promotional truck when it passed through the city this summer, with the company donating £1 to charity for every passerby that ‘spent a penny’ while learning about the latest shower toilet technology. The campaign was part of a nationwide initiative to introduce more people to this latest technology for the bathroom, and highlight the many health and well-being benefits of choosing a shower toilet rather than a standard model. Each person coming aboard the Geberit AquaClean tour was invited to try the Geberit AquaClean shower toilet out for size. By doing so, they were also doing their bit for charity, with £1 being donated by Geberit to Forever Manchester for every visitor penny spent. A cheque for the princely sum of £1,000 was presented by Denise Walker.